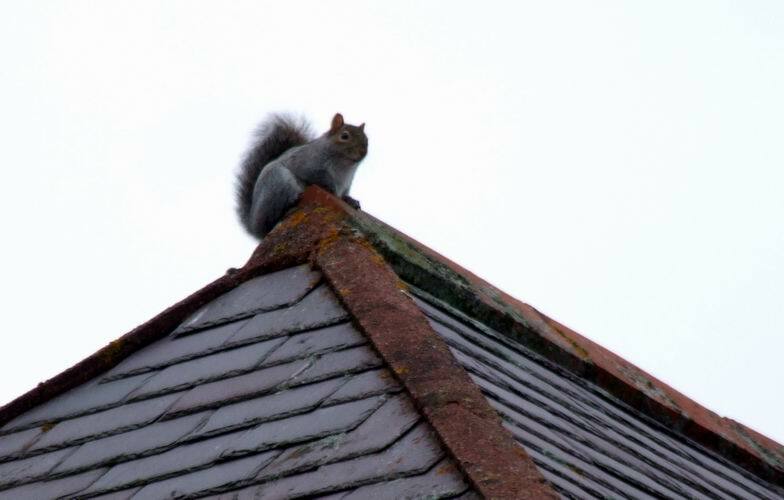 Making use of the 300ml telephoto end of the zoom lens on my new camera I was able to get a reasonable photograph of this squirrel sat right on the apex of next door's roof. I have a tolerance of these cute creatures and have explained to them that, as long as it is only the bird food they are eating, they can stay: if they touch my bulbs war will be declared. As I try to catch up with lifting the last of the fallen leaves I am seeing all sorts of shoots pushing through like this Eranthis hyemalis. 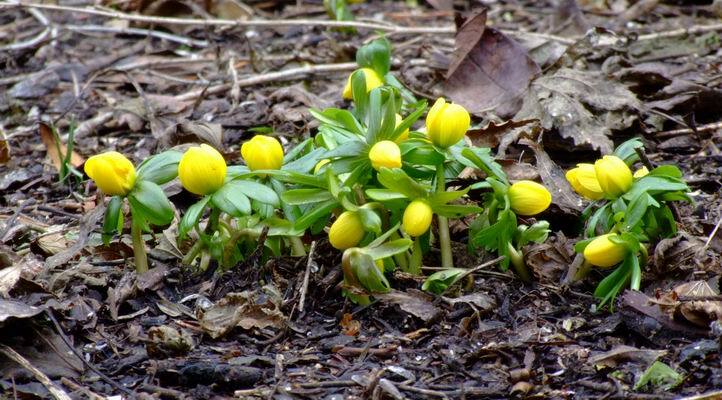 The Eranthis has spread around by self seeding and while there is little obvious variation to be seen in the flowers it is amazing how variable the flowering time is, this is our earliest group. 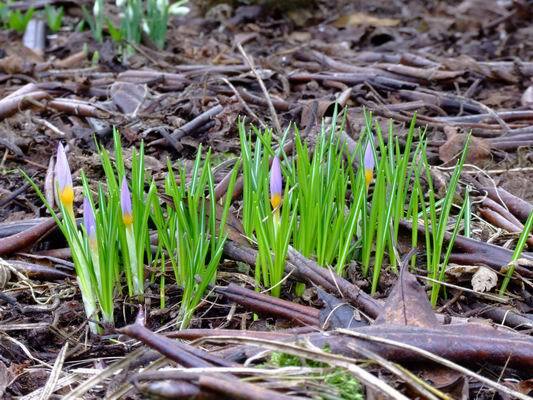 Crocus sieberi atticus is also starting to show flowers. It is a very reliable crocus for us, increasing well and always flowering freely but I notice that this group does not have so many flowers. Perhaps the answer is that it has been heavily over grown by other plants, like Dicentra, for the last few years and now it is not so well flowered as other groups that do not have this competition. 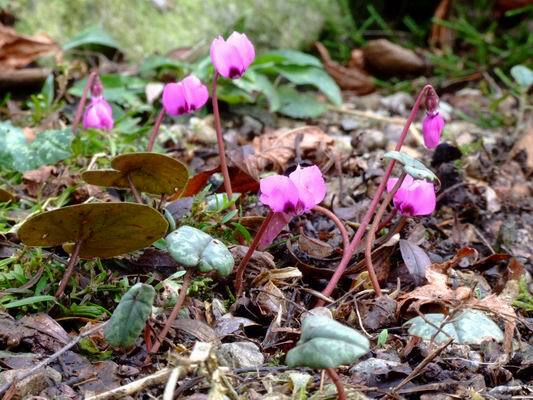 I have mentioned before that Cyclamen coum never does that well for us compared to the wonderful self seeding colonies I have seen in gardens in the south, this is one of our groups raised from seed collected in Turkey on one of the Cyclamen Society trips many years ago. We have a few groups like this that survive and flower but never really look happy - I will continue to sow seed until I find a form that will grow well for us. 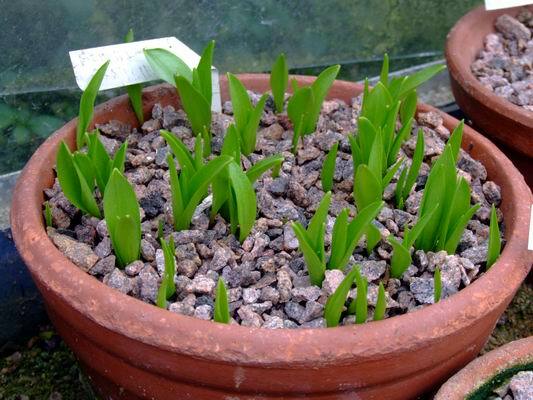 A few people, used to seeing us taking large clay potfuls of bulbs to the Shows, have expressed some surprise at our change back to small plastic pots. 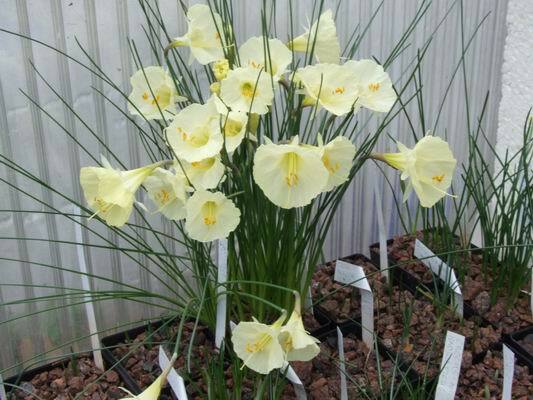 I must admit that it was a big decision as we also enjoyed the large well flowered pots but I need not have worried as even a small 7cm square plastic pot is able to provide a show like this Narcissus romieuxii, one of our own selected seedlings, it has 24 flower stems. I could easily double pot it into a clay pot and with careful top dressing it would present a fine exhibit on a Show bench that I would be proud of. 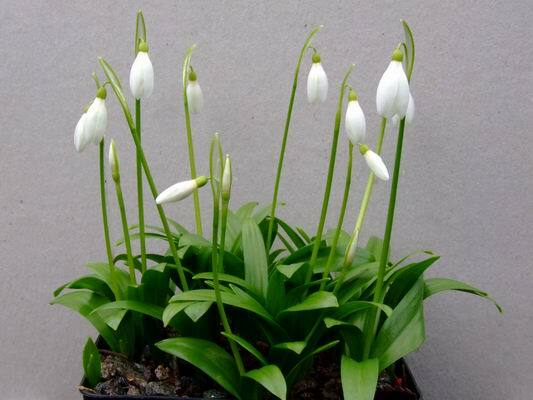 I do grow some Galanthus and this one we bought some years ago, and at some expense, as Galanthus platyphylus: I leave it to you Galanthophile experts out there to let me know if we have the true species or not. 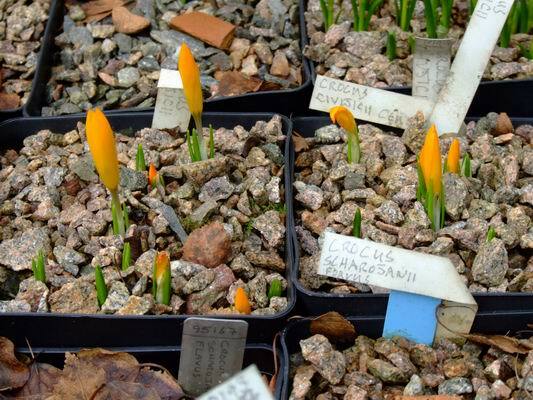 In the frames Crocus civijicii is showing not only colour but evidence that the slugs are about in the milder days - I will have to add some slug pellets. This is also a good warning to get some slug control into the seed frames as a hungry slug can devour an entire potful of germinating seedlings in less than an hour. 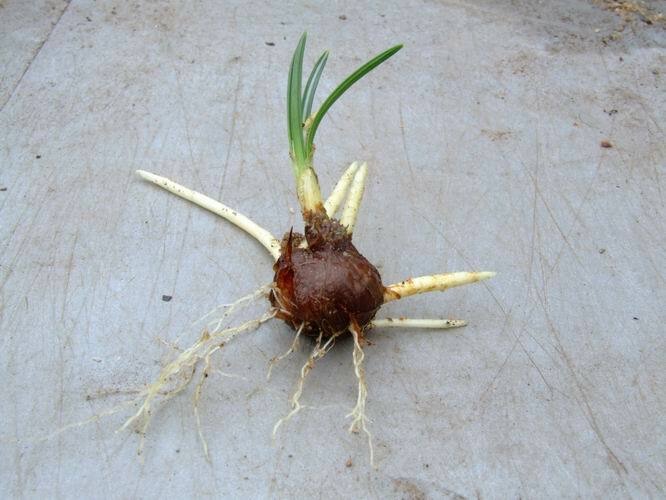 While I was fiddling in the sand plunge of the frit house I noticed this Crocus nudiflorus corm, which was self sown into the plunge in the days when this used to be our only bulb house, was pushing its stolons up out of the sand. It is always interesting to see how these bulbs grow so I lifted it for a look and to get a good digital photograph as well. I have thousands of slides of bulbs in every stage of development and I am still building up my catalogue of digital images. In the frit house many more frits are showing and the early flowering ones like Fritillaria stenanthera have started to put on their spurt of growth. I now need to increase the moisture levels and I am watering directly into the pots of all the ones that are growing. Remember my theory to water in proportion to the amount of leaf showing - this is based on the fact that as the leaves grow the plant requires water to form the building blocks. I should warn that I do not water in freezing conditions I try to water in the morning of a bright sunny day so there is plenty of time for the surplus moisture to drain away before the temperatures drop at night fall. It is also interesting to observe the different ways that the growth of the frits occurs. 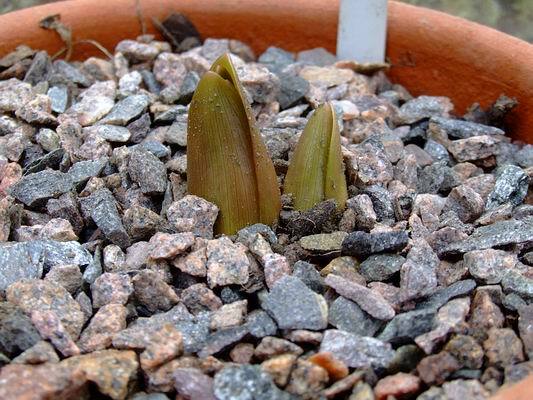 The Fritillaria stenanthera pushes its stem up and will flower as the leaves develop while it is the leaves of Fritillaria davisii that appear first and it will be some weeks before the flower stem pushes up - it still needs watering. 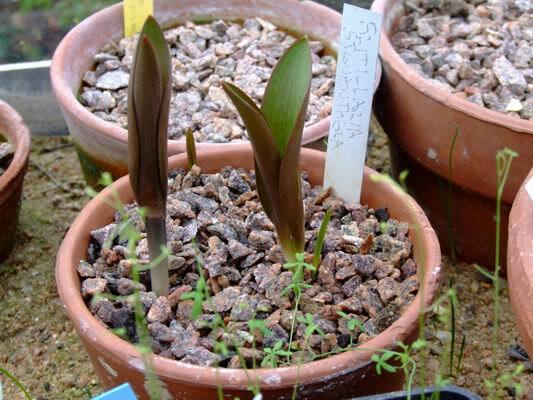 Oh, joy and progress for the first time, my bulb of Fritillaria chitralensis has two shoots coming : surely this will result in me having two bulbs at the end of the season. It has been very slow to increase as the seed I have had from it has not proved very fertile and very few have germinated. Perhaps it will produce better seed if I have two clones and as I have a few seedlings coming along this will be possible in a few more years but until then I can look forward to two flower stems on this clone. Back to lifting the leaves and another plant, not a bulb, that is well advanced and always a welcome early flower this Adonis amurensis.